West Yorkshire Wedding Photographer – that’s what my loyalty card should say. This is for all the service stations we visit on our motorway network, as we zip around the county! 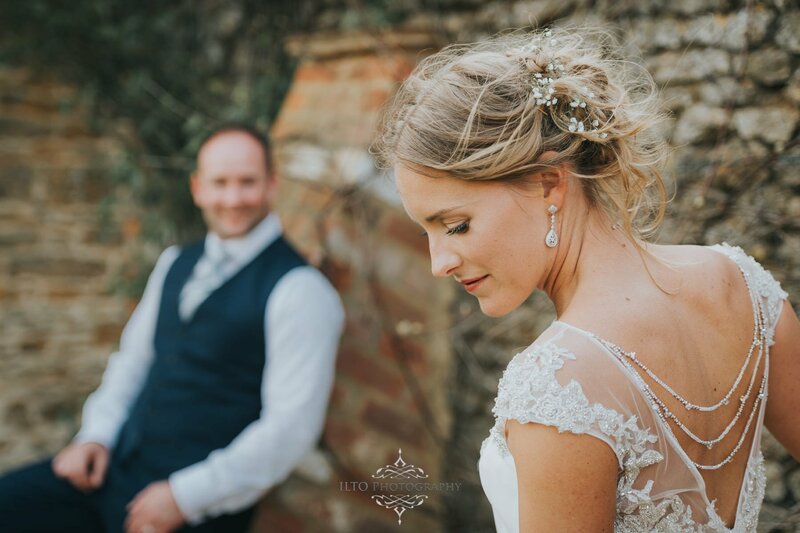 This time, we were heading to Northampton, to spend the day with Emily and Craig, at the wonderful Dodford Manor. For the 2nd time in 24 hours, we were greeted by a glorious day also – blue skies and rising temperatures! Covering wedding preparations is a tricky and rewarding part of the day for us. This time it was made a lot easier at Emily’s parent’s house, as there was plenty of space and bucket loads of natural light! That said, the girls all had their hair and makeup done in the smallest room in the house. Not surprisingly, this meant there was lots of laughing and us saying “sorry!” a lot as we squeezed and shuffled around! Thankfully Craig was only 20 minutes away, and he had a great space to get ready in to get ready in also. All on his own, as the groomsmen had separate rooms! We got to the church as the final bits were being tweaked. Before we knew it, a beaming Emily was gliding down the aisle towards Craig. The Vicar on the day was awesome! This is something else we’re not used to. In no time at all we were taking the signing of the Wedding Register shots. The formals got off to a great start, as I climbed my little platform thing to get a better angle and get everyone in …… and ripped a massive hole in my jeans, thus leaving my undercarriage perfectly ventilated for the rest of the day! Anyway, I won’t ramble on, as I want you to check out their pictures, but I could honestly write volumes about his wedding. This is because in the 5 years we’ve been doing this, this was without a doubt one of the best ever. The very best! (and I’ve not even mentioned the mother of all confetti shots, the convertible Beetle, the vintage VW Camper van and the Mariachi Band!!) For some reason, all the bits and bobs they had, seemed perfectly at home at Dodford Manor. The reason was because, like many, Craig and Emily weren’t overly confident to start with when it came to having pictures taken. This was something we discovered on the pre-wedding shoot. However, on the day, they decided to just go for it and, fully embrace it. They rightly said, “we’re only doing this once, and we want the pictures to be as great as possible” … music to our ears! This is why they came across so amazingly well on camera. No, they’re not models, they’re Paramedics in West Yorkshire!! Yorkshire’s hottest Paramedics? I think they probably are! On top of this, all of the guests were up for it too! It’s the only wedding I can remember in recent times where everybody got involved properly. Not one single person held a hand up over their face and said “Noooo! I don’t take a good picture – I hate it!” … which is when I point out that “I do take a great picture and love it“, they then smile and I get a shot anyway! Tired West Yorkshire Wedding Photographers, yes, you could say that, but very happy ones too, and this is one of our favourite weddings ever!